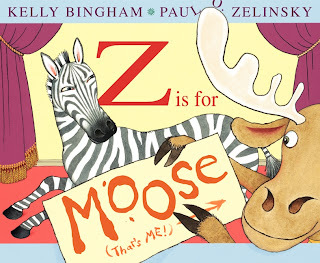 If you haven't picked up this book yet to read with your child, you MUST get it! Not your typical ABC book- because the moose is a "little" crazy and wants to show up when it isn't his turn! This one will not disappoint. This is one I could read over and over! I'd suggest that you wait until your child knows their ABCs and the sounds it makes. Such as knowing that A is for Apple, etc. Or if they know some and you think they'll understand the sillyness of the book, then go get yourself a copy of this book! This sounds like a fun book. I will have to check it out! I like that it is a little different. this book out at library on our next trip. You know, I've been looking for a book like this. Alysia thinks that she knows her alphabet, but really she doesn't. She perceives the alphabet books that we have as too 'baby'.